What's the difference between "open" rhinoplasty and "closed" rhinoplasty? 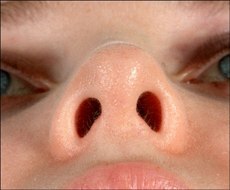 In an "open" rhinoplasty, a small incision is made in the columella, which is the little column of skin that separates the two nostrils. That incision allows the nasal skin to be lifted off of the tip of the nose. That's the only difference between the two techniques. In both open and closed rhinoplasty, many other incisions are used up inside of the nose, but the open technique also has that one little extra incision in the base of the nose. The photos below show the location of the open incision. The two identical photos were taken after healing is complete. It's quite hard to find the scar. The open technique has huge advantages over the closed technique, in my opinion. The main advantage is that it is much easier for the surgeon to see and work on the nasal tip cartilages in their natural positions. With the skin lifted up, it's easier for the surgeon to see what needs to be done, and to accomplish those tasks. The little scar heals superbly. The use of the open technique allowed me to take all of the nice intra-operative photographs that you see in the intra-operative rhinoplasty tutorials on this Web site. Open rhinoplasty is a great teaching tool. Plastic surgeons debate the advantages and disadvantages of the open vs. closed techniques, just like they debate practically everything, and you'll find plastic surgeons who argue vehemently for each technique. I strongly favor the open approach, but some plastic surgeons get excellent results with closed rhinoplasty, so don't select your surgeon based on the open vs. closed question. Select your surgeon based on his overall skill in performing rhinoplasty. Go here for more information on finding a competent rhinoplasty surgeon. All of those conditions don't happen too frequently; I use the closed technique only about 5% of the time.